The Toyota’s and Honda’s on the roads today better start looking at their rear view mirror, because the up-and-coming Chevy Cruze might have more than enough to make noise in this particular car segment. [firstpara] It looks sporty and cool, and is powerful to boot. Plus, its starting price of just around P800,000 surely makes it a worthy competitor to the current crop of cars in its class. To overtake, you need power, and this Chevy doesn’t suffer from a lack of that. The Cruze will have you cruising along EDSA with its 1.8-liter 16-valve gasoline engine that features variable valve timing, and produces 141 hp at 6,200 rpm, and a max torque of 176 Nm. With that kind of power, the Cruze is definitey responsive and speedy. The engine is also touted to be among the most efficient on the market when it comes to power output-per-liter. As for its transmission, the entry level model features a five-speed manual gearbox (the L model) while the two higher models (the LS and the LT) boast a six-speed automatic transmission. While fast, Chevrolet has also made a point to keep this ride safe. It has included safety features like anti-lock braking (ABS), traction control (TCS) and optional Electronic Stability Control (ESC). The Cruze also boasts of having one of the stiffest body structures in its class, with about 65% of the structure made of high-strength steels. This is a 50% improvement over previous models. And the result? Less noise inside, less vibration, and less ride harshness. These features also allowed the Cruze to be granted a five-star Euro NCAP crash safety rating—the highest rating possible. So basically, what we’re saying is, this car doesn’t take any shortcuts when it comes to securing its passengers. 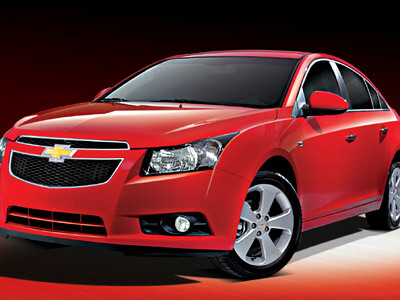 Have we mentioned that the Chevrolet Cruze is a looker too? Never mind the tacky name, the Cruze is a cross between the Altis’ upscale looks, and the Civic’s sportier cuts. Throw in a little bit of edginess from the Mazda 3, and those are the ingredients that give the Cruz its appeal. From its arching roofline to its low stance to Chevy’s signature dual-port Grille, the Chevrolet Cruze gets five stars from us in terms of looks. Sure, there may be more eye-catching or flashier cars out there, but the Cruze’s solid looks will make you proud as an owner. Undoubtedly, it looks like the sedan market has just gotten a little more cramped with the recent release of the Cruze. We won’t be surprised if a few months from now, we’ll see frequent sightings of this car in EDSA.